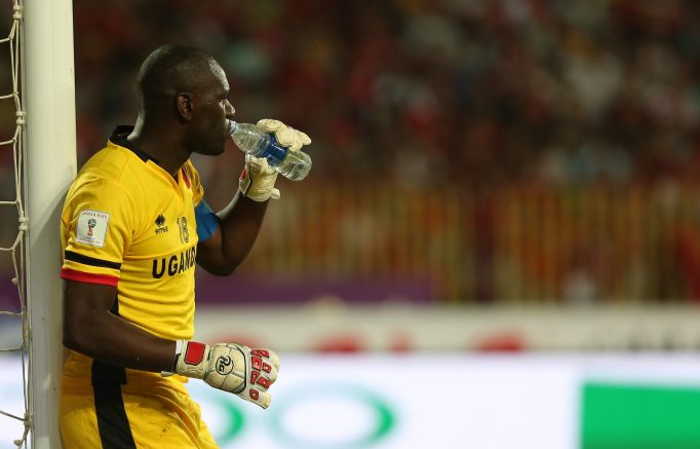 NAMBOOLE – With less than 24 hours to the game between Uganda Cranes and Cape Verde, Captain Denis Onyango is very confident that his team will make it to AFCON next year. The cranes currently lead Group L with 10 points and need only one more from their last two Group L games to seal qualification to the finals in Cameroon next year. While speaking to journalists on Friday, Onyango stressed that the team is 100 % focused to the task ahead and the boys are ready to give their best. “The boys are aware of the task ahead so we are all ready to give our best so that we qualify for AFCON next year. Onyango said. The skipper also added that the opponents (Cape Verde) are motivated and all they want is a win in tomorrow’s match but Onyango said the Cranes will not give them a chance. “There is no easy game, and Cape Verde wants a win but our players are ready to defeat them at whatever cost so we won’t give them the chance. ” he said. The two nations square at the Mandela National Stadium on Saturday afternoon. Cape Verde is currently third in group L with 4 points, Tanzania second with 6points while Lesotho has 2 points. Uganda Cranes play Tanzania away in their last fixture next year in March. The game at Namboole will be officiated by Tunisian referee Youssef Essrayri. Goalkeepers: Denis Onyango (Mamelodi Sundowns, South Africa), Jamal Salim (El Meriekh, Sudan), Charles Lukwago (KCCA FC, Uganda). Defenders: Murushid Juuko (Simba SC, Tanzania), Nico Wakiro Wadada (Azam FC, Tanzania), Godfrey Walusimbi (Kaizer Chiefs, South Africa), Hassan Wasswa Mawanda (El Geish, Egypt), Dennis Iguma (Kazma FC, Kuwait), Isaac Isinde (Kirinya Jinja SS, Uganda), FC, Isaac Muleme (Haras El Hodood, Egypt), Timothy Denis Awanyi (KCCA FC, Uganda). Midfielders: Khalid Aucho (Church Hill Brothers, India), Moses Waiswa (Vipers Sc, Uganda), Joseph Benson Ochaya (TP Mazembe, DR Congo), Ibrahim Sadam Juma (KCCA FC, Uganda), Tadeo Lwanga (Vipers SC, Uganda), Allan Kateregga (Cape Town City, South Africa), Milton Karisa (MC Oujda, Morocco), Allan Kyambadde (KCCA, Uganda). Forwards: Edrisa Lubega (SV Ried, Austria), Patrick Kaddu (KCCA FC, Uganda), Faruku Miya (Gorica, Croatia), Emmanuel Okwi (Simba Sports Club, Tanzania), Derrick Nsibambi (Smouha, Egypt).